← Bridal Shower Wine Charms – Stampin’ Up! 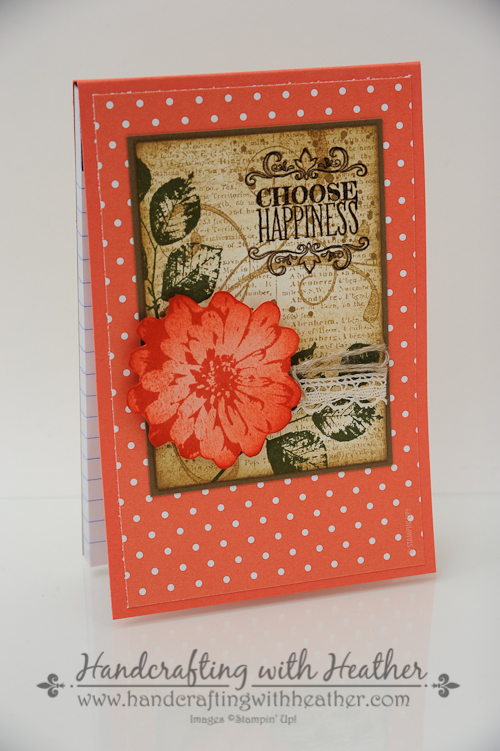 Choose Happiness Notepads – Stampin’ Up! 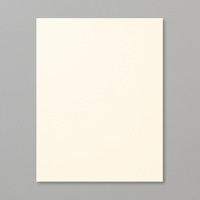 These adorable notepads are so easy to make, and can be altered for any color scheme or stamped design. They would make great gifts too! I purchased some small notepads from Staples and Amazon.com for this project today, but you could really make them in any size. 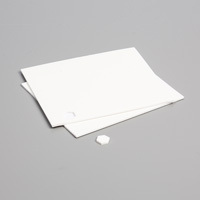 I prefer to use “Gum-Top” notepads, which means they are glued along the top edge, rather than having cardboard wrapped around the top and secured with staples. However, either type of pad can be used for this project. The process I use for making these pads is the same, regardless of the dimensions. For this post, I am going to tell you how to measure your notepad to make a cover with a perfect fit, rather than focusing on the dimensions of this specific project. 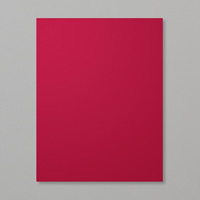 For example, if your notepad measures 3″ x 5″ and is 1/4″ deep then you would cut your card stock to 3″ x 6-3/4″ then you would score it at 1-1/2″ and 1-3/4″. Of course, where you score your card will depend on the dimensions of your notepad. The first score mark will always be 1-1/2″, but the second score mark will depend on the depth of your notepad. 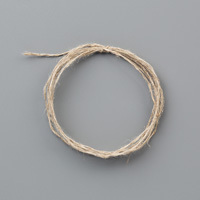 To determine the second score mark, add 1-1/2″ to the depth of the notepad. 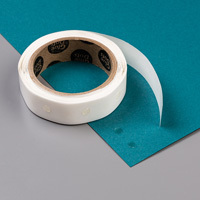 Once you have scored your card stock, wrap it around the front of the notepad and secure it on the back of the notepad with a strong adhesive, such as sticky strip, Fuse Adhesive, or Multipurpose Liquid Glue. 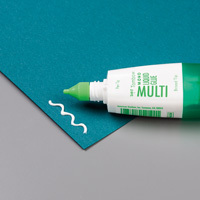 Be sure that you don’t glue along the top edge of the notepad, just on the back. Once the cover is in place, you can really decorate it any way you want. 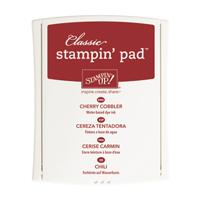 For this set, I created notepads in Blackberry Bliss, Crisp Cantaloupe, and Cherry Cobbler. I used coordinating DSP from the Background Designer Series Paper stacks and added a beautiful art piece featuring several stamp sets from Stampin’ Up! I began by stamping the Dictionary background stamp in Baked Brown sugar on a panel of Very Vanilla card stock. Next, I stamped the flourish image from Everything Eleanor in the same shade, and I added some ink splotches from Gorgeous Grunge too. Then I used Mossy Meadow ink, and the leaf image from Kinda Eclectic to add some foliage. Next, I sponged the background with Baked Brown Sugar ink. Finally, I added some Venetian Crochet Trim and Linen Thread to the panel. 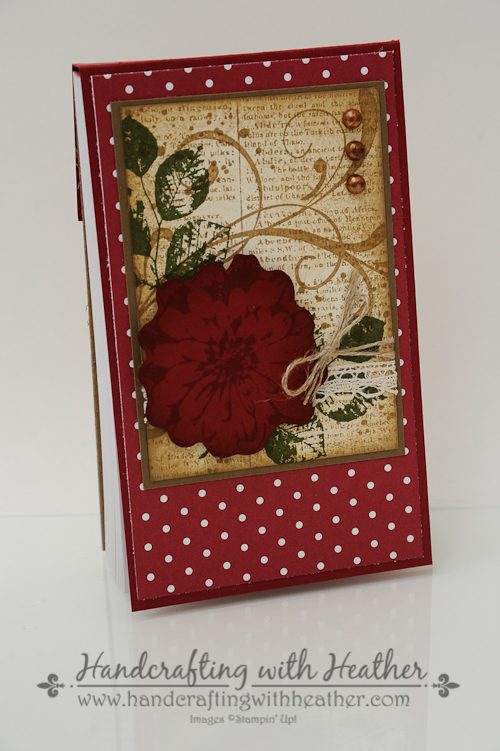 I stamped the flower image from Choose Happiness in the same color card stock as I used for the cover of each notepad. 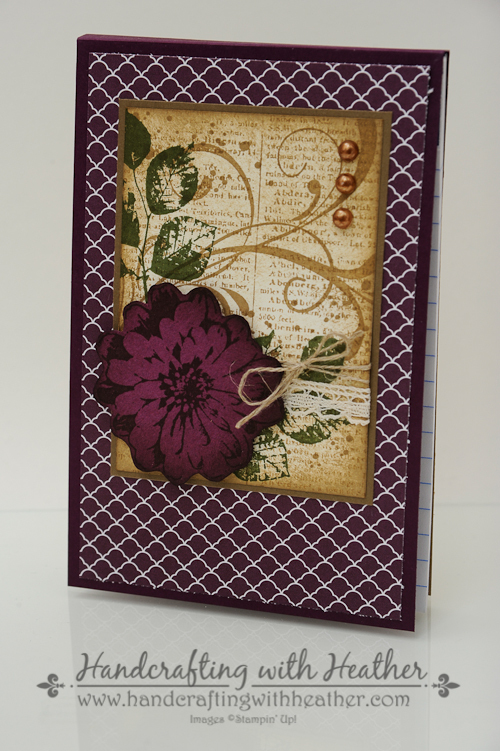 For the Blackberry Bliss and Cherry Cobbler pads, I used the coordinating ink color and sponged around the edges with it too. 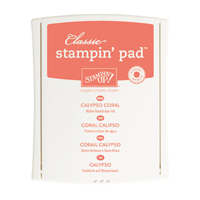 For the Crisp Cataloupe pads, I wanted a little more contrast for the flower, so I used Calypso Coral ink. Finally, I added the flower to the background with Stampin’ Dimensionals and mounted the entire piece on a Baked Brown Sugar mat. For one of the pads, I stamped the “Choose Happiness” sentiment in Early Espresso ink to finish it off. 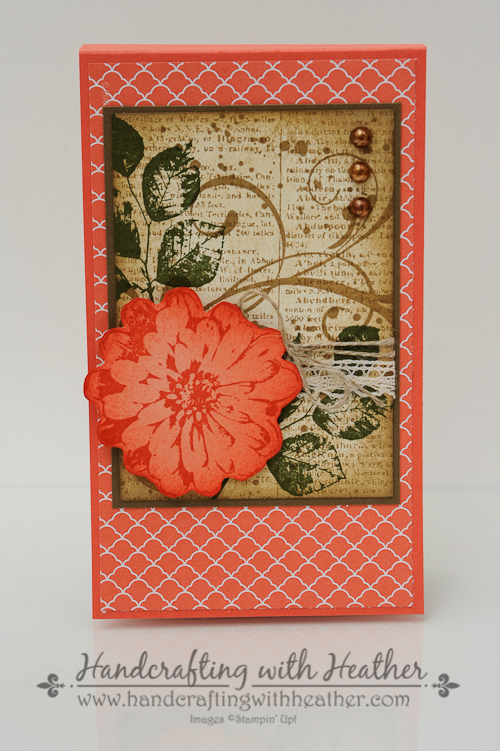 For the others, I colored three large pearls with my Bronze Stampin’ Blendabilities Marker (from the Skintone set). Then I added them to the top right corner of the art piece for a finishing touch. I know you are going to want to save this idea for later, so you should definitely pin it to Pinterest. You can find a “pin it” button at the very bottom of this post. To subscribe to my blog via email, just click on the “follow” button in the sidebar near the top. Also, it is not too late to sign up for my one-to-one card swap. Cards are due to me by July 10, which is a little less than two weeks from now. The details and registration link are below. I hope that you will join in the fun! Tomorrow is the Last Day to Sign Up for Only $50! Tomorrow is the last day to take advantage of the $50 sign up special from Stampin’ Up! If you have at least $50 worth of products you would like to purchase from the new annual catalog you should really consider joining. There are many benefits of becoming a demonstrator including a great discount and access to advanced products. 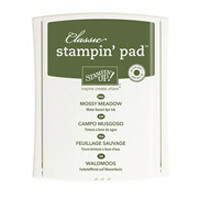 Did you know you could order several of the Stampin’ Blendabilities marker sets now if you were a Stampin’ Up! Demonstrator? These are lovely. They will make cute, quick notepads for friends as little Thank You gifts or whenever you feel like showing someone you care! Fabulous creations. Your work is so beautiful. Thanks for sharing it with us! So very nicely done!!!! Wow, Heather, what a fantastic project; it’ll make a lovely gift! Thanks for sharing. These are just fabulous! So beautifully done! I am going to have to CASE this one! Thanks for sharing! Oh, what crazy good luck! I had bought 12 notepads just the other day to give as gifts. I planned to just wing it when trying to decorate them. Your instructions are great! Cute project. Thanks for sharing. Heather,those notepads are absolutely beautiful. Thanks for sharing. I really like your black and white card Bloom and Hope.! It’s a favorite! Thanks for sharing!